Hunter King struggles to keep his town from falling apart. With the Government Security Agency threatening to close down The Slayer program, an unknown beast on the loose in his city, and commanders at other locations disappearing, he finds himself at the breaking point. Dominic follows clues that bring him closer to Florin while Chari finds herself struggling as a slayer when her heart belongs to a vampire. On this night, loyalties will be forged, promises broken, and secrets revealed. In a war between all, some will live and some will die, but everyone’s lives will change. Q.You are very prolific. What’s your secret for getting so much work done? A. My secret is consistency. Every day, I sit in front of my laptop and I write. I may only write 200 words (on a bad day) or 3000 words (on a good day) but there is never a day that goes by when I don’t write. A. I fell in love with reading at the age of fourteen. I started the series Flowers in the Attic by V.C. Andrews. That series sparked this insatiable need to read more. Over time, I’ve read and enjoyed books by: Nora Roberts, Stephen King, James Patterson, Sandra Brown, Jude Deveraux, And many more. Q. Are there any new authors that have grasped your interest? A. With the increase of indie authors, there are gems everywhere. I’ve enjoyed books like The Body Departed by J.R. Rain and Divergent by Veronica Roth. I recently read The Edge to Never by J.A. Redmerski. Q. From the looks of it, you have five series and several standalone books in different genres and you’re branching out into horror. Which genre do you enjoy the most? A. So far, I’ve written in Romance, Mystery thrillers, Sci-Fi, Urban Paranormal, and supernatural horror. Each genre has fulfilled my need to dabble in categories across the board. I don’t have a favorite genre. I thrive in the elements of the story and the characters. I do have to admit, I love the adrenaline rush of writing a fast-paced fight scene. Note to the reader: Due to the overwhelming demand by the readers for a full-length novel of Disciples of the Damned, I have made some changes in the setup of the series. The Seasons will now be composed of four (4) short stories and a season finale full-length novel. When Chari goes on the lam with Dom, she tries to discover who turned her mother into a vampire. Dom learns his true connection to Chari. The Vypers are seeking revenge and Florin's West Coast horseman, Duke Mathias, is out for blood. Treaties have been broken, blood has been spilled, and chaos in Ransom, California will not go quietly unnoticed. Chari's having second thoughts about her career as a slayer and finds an ally in an unexpected place. When she gets her chance to kill Florin, will she or won't she? Dominic takes Shane up on his offer only to find himself working secretly for The Vypers in order to get information that will bring him closer to Florin. After more than 200 years of being dead on the ocean floor, vampire Dominic Kollar is released in the year 2012, only to find out that the rules have changed. Bounty Slayers are responsible for keeping Vampires in line. As Dom acclimates to the strange modern world, he discovers that he really likes two things: riding motorcycles and the sight of a mysterious, bewitching lady. Aided by an old vampire frenemy, Dom confronts human bikers in order to infiltrate their gang and find the object of his blood lust. As long as he can keep himself fed in this new world of challenges, Dominic Kollar will make a stand, avenge his past and attempt to destroy those who dared to cross his path. In a treacherous journey to break the curse of a pendant connected to his twins, Apollo travels to a land where vampires and werewolves were born--a land where good and evil, light and dark, collide. With time against him, he seeks to understand and alter his children's destiny while he confronts his foes who possess supernatural powers he never knew existed. Now, Apollo must confront his past, face his present and make decisions that could alter his future. Will he save his children, or lose them to the curse forever? His sister is in the hands of the enemy. The town where he lives claims that the woman he loves is dead. The Sanguis clan leader has disappeared. And Apollo is running out of time. In a hurry to leave the forest of Stockwood, Washington, and the feud between his vampire family and his werewolf bloodline, Apollo and Sophie flee to a neighboring town in order to seek a "normal" life together. Protecting Sophie is the only thing on Apollo's mind--until he finds himself in the middle of a town with a deadly secret--a secret which includes everyone he loves. Apollo and Amaya Shelly are twins, living deep in the forest of Stockwood Washington and away from civilization. Raised by their father and under the protection of their leader, Maximiliano, Apollo and Amaya live what they consider a normal life with the Sanguis clan. 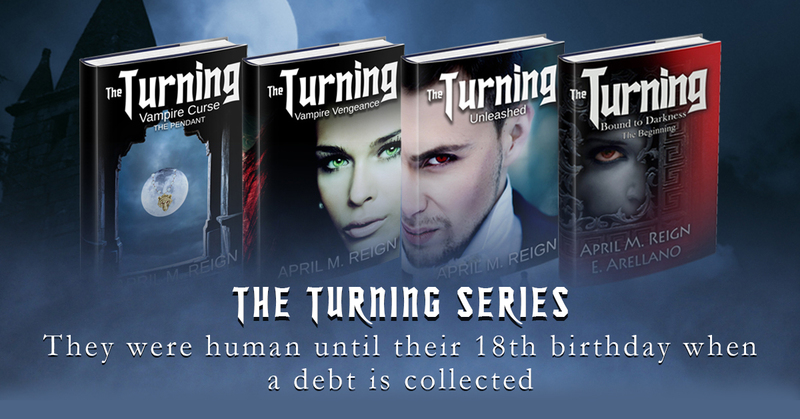 Three days before their 18th birthday, the twins discover that their "normal" existence is anything but normal: their father and the Sanguis clan are vampires. Worse yet, they learn that an agreement was made that would predestine them to become vampires on their special day. In a chilling race against time, the twins uncover a secret that could destroy their lineage and alter their existence. Whether past or present, family or clan, the line between good and evil can easily blur. . . The scientists of the twenty-first century were right about one thing--the future was bright. But beneath the neon lights of the world’s smart cities was a darkness that would consume my very soul and rip my conscience apart. That is the part they didn't foresee. Now Planet Earth is in grave danger. I was an Elitist once, but I have evolved into something else; something infinitely more dangerous. My name is Geneva, and I have become an Elemental. I should have never taken that deal. Some lost islands contain no hidden treasures; some hold only death. And if you thought wishes could only be granted by genies trapped inside antiquated magic lamps, think again. I made such a mistake once, and it has proven fatal. Because of me, Planet Earth is in grave danger. I was an Elitist once, but I have learned my lesson. Now I must make amends. My name is Ayo, and I have become an Elemental. We knew the Elitists almost succeeded in their plan. Our plan. As former Elitists ourselves, we, too were responsible. But after barely escaping death in the City of Lights, the Island of Death, and every godforsaken place in between, we have each had a change of heart. From this moment, we shall fight back, together. An ancient force of nature threatens the modern world, and if we can’t stop it, Planet Earth will have no future. Designed by InkHive. © 2019 April M. Reign . All Rights Reserved.